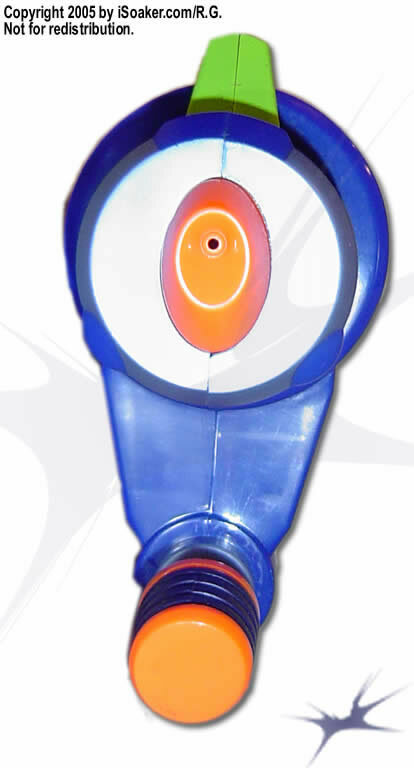 The Super Soaker SoakerTag Elite: Aquapack Devastator is the largest of the 2005 SoakerTag Elite line. It is also the first backpack-based Super Soaker seen since the Super Soaker SC Big Trouble released back in 2000. 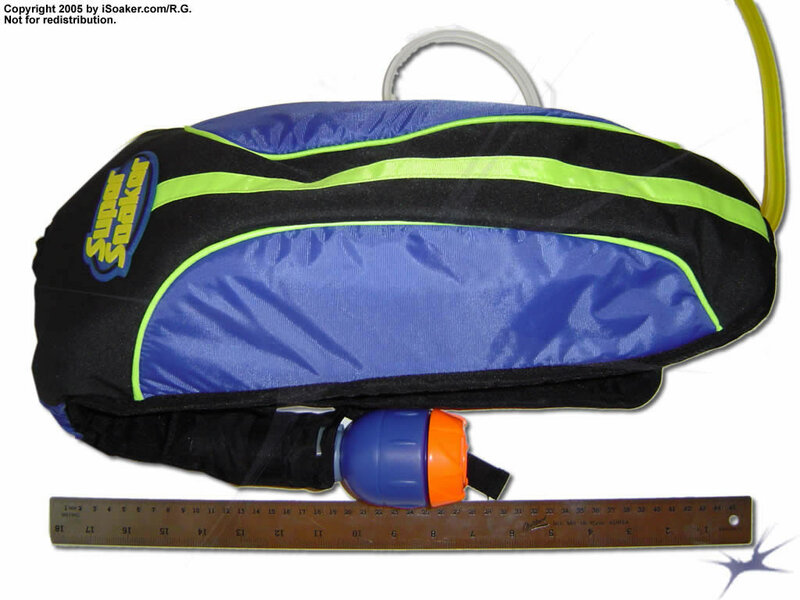 Unlike the earlier CPS-backpack soakers such as the Super Soaker CPS 3000 and Super Soaker CPS 3200, the Aquapack Devastator has both a smaller blaster component as well as a smaller, though sportier backpack reservoir. 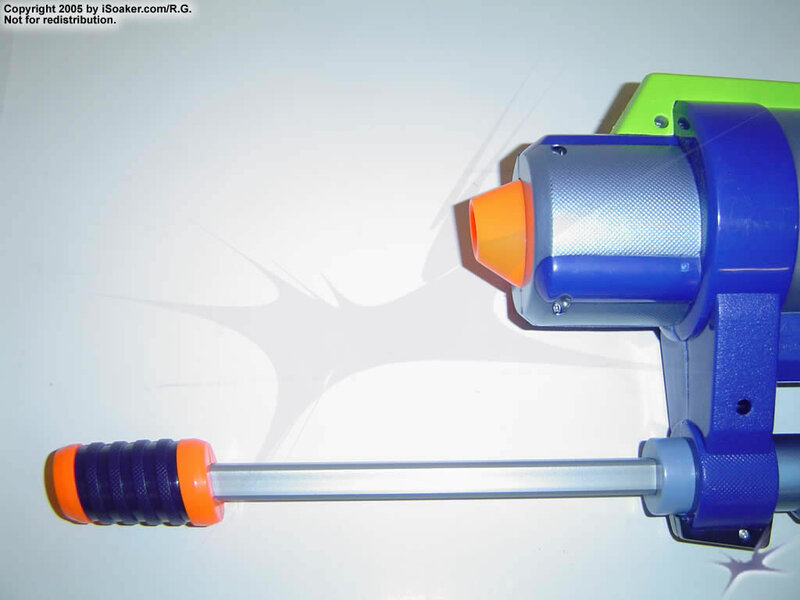 The general size and shape of the blaster is similar to the Super Soaker SC 600, though it produces a thicker, more potent stream and is, of course, fed by the backpack reservoir. The Aquapack Devastator features only one nozzle setting. This is a little surprising since this soaker carries the most water of the 2005 SoakerTag Elite series. However, the stream pushed forth from the nozzle is good and solid despite being smaller than nozzles on older generation soakers such as the Super Soaker CPS 2100 or Super Soaker CPS 1200. Another good thing is the nozzle is powered by a CPS-pressure chamber. It has been three (3) years since the appearance of a new CPS-based blaster on the market so hopefully this signifies the beginning of a new wave of CPS-based blasters for the coming years. The pump for the Aquapack Devastator feels decently solid with a stroke length roughly 16cm. The pump shaft is square, thus locking the pump-grip into a fixed angle. The pump grip's region is a little on the short size, but this does not serious affect performance. Interestingly, there is a gap between the majority of the pump housing and the body of the blaster. It is here that one almost instinctively places one's pumping hand when aiming and not pumping. The pump does has a slight lag when pulling water, thus limiting maximum pumping rate. This is likely due to the fact water needs to be pulled through a fairly long length of tubing from the backpack to the blaster portion, but the effect is more pronounced than felt on other blasters such as the Super Soaker SS 300 or Super Soaker CPS 3000. The trigger and hang-grip area are nicely moulded and quite comfortable to hold. The grip region features some texturing for more security even when wet. Apparently based on the Max-D trigger valve system, the trigger needs to be pulled completed to release the stream; partial pulls will not open the nozzle at lesser widths. The resistance of the trigger is a little stiffer than on previous Max-D soakers, but perhaps this is due to the fact that these blasters are being targetted to a slightly older crowd with presumably stronger hands in general. The back of the blaster portion has a fairly sturdy belt-clip. This subtle design feature is actually very useful. Thanks both to the sturdiness of the backpack and the relatively smaller size of the blaster, the blaster portion can easily be hooked onto one's belt loop or onto one of the backpack's straps when not in use or for times when one needs both hands free. This means that the Aquapack Devastator can be used easily in combination with another blaster or brought along as a heavier back-up blaster. The most notable feature of the Aquapack Devastator (apart from the fact that is uses CPS tech) is that its reservoir is housed in a particularly sturdy, sporty backpack. Of all the other backpack soakers, the Aquapack Devastator's backpack wins, hands down, when it comes to comfort when wearing, overall feel, and features (albeit not everything works as well as intended). The backpack holds a decent amount of water, but a similar volume has been seen in the past in single-piece soakers such as the Super Soaker CPS 1000 or Super Soaker CPS1500. However, even when filled, the backpack feels extremely comfortable and unimposing, allowing a good deal of freedom of movement. The fill-port of the backpack is actually slung over one's left shoulder and is designed in such as way that one can theoretically refill the blaster without needing to remove it. On the right-strap is a clear piece of tubing with a small, floaty ball in it that rises as the water level in the backpack rises. Thus, one can rough gauge how much water is remaining in the reservoir and how much more needs to be put in when filling. Of course, things do not quite operate as smoothly when attempting to fill the backpack when wearing it. While the cap does feature an improved Fast-Fill system, having a hose pushing in water into a small opening right beside one's head tends to cause some spraying. Removing the cap and filling works well, but one needs to be careful not to overfill. Being a soft-pack, compressing the backpack slightly against one's back when the reservoir is almost full will push water out of the fill-port. This can lead to unexpected water coming forth from the fill-port and down one's shoulder. The fill-gauge works, but the tubing with the floaty tends to get obscured by the backpack's strap, making it more difficult to see. As well, having an additional piece of tubing joined to the reservoir is also one more possible point of breakage if one is not careful. As a whole, the blaster combined with a sporty backpack reservoir makes the Super Soaker SoakerTag Elite: Aquapack Devastator a good, all-around soaker. While some would argue that this reservoir volume does not deserve a backpack, its design opens up carrying larger volumes to more players who may not like carrying as much weight on their arms. The nozzle is on the smaller side for a backpack blaster, but this also means longer playing times between refills for the user. While not recommended when facing Super Soaker CPS 1500 or larger blaster users, the Aquapack Devastator can definitely hold its own in the majority of water fights (and definitely all SoakerTag matches) out there. Very comfortable and sturdy backpack reservoir. Good reservoir to firing chamber ratio. Blaster clip a nice feature as is the fill gauge and over-the-shoulder fill port. Only one nozzle setting. Slight lag when pumping, limiting pumping speed. Over-the-shoulder filling can result in accidental water release from the port if overfilling. Fill-gauge often gets obscured by the shoulder strap. The Aquapack Devastator is one of my favorite soakers this year. It holds lots of water (about 98 oz) and has a range of 25 feet! It took me a LONG time to empty the tank. The nozzle is pretty powerful. The trigger is comfy. The clip makes it a great backup blaster. The pump is sturdy and the backpack is comfy! The quickfill cap works well to and doesn't leak. And it looks great! A bit difficult to fill without taking it off. pump has slight lag. only one nozzle setting.